Had the distinct pleasure to attend most of the American Chesterton Society’s National Convention at which I was the concluding speaker this final Saturday afternoon before evening Mass and the concluding banquet. It was a whirlwind of a convention covering the theme Education, Economics, and Everything Else. It was my first G. K. Chesterton Convention, and I hope that I can make many more to come in the future. I have been so long a devoted fan that it feels good finally to connect with my fellow devotees. So you can imagine the great cheering and applause that erupted when Dale made the announcement in his opening talk that Chesterton’s cause for canonization in the Roman Catholic Church is being officially opened in his home diocese of Northampton, England. What this means, for those not familiar with the process of sanctification in the Catholic Church, is that they will next determine his status as a “servant of God”. Other steps will follow after this, but I think the big one towards full sainthood is the verification of two miracles. That and the Pope’s blessing on the matter should hopefully seal the deal. Those of us in the Society can count many more than just two miracles, but Rome’s definitions are perhaps stricter than ours. 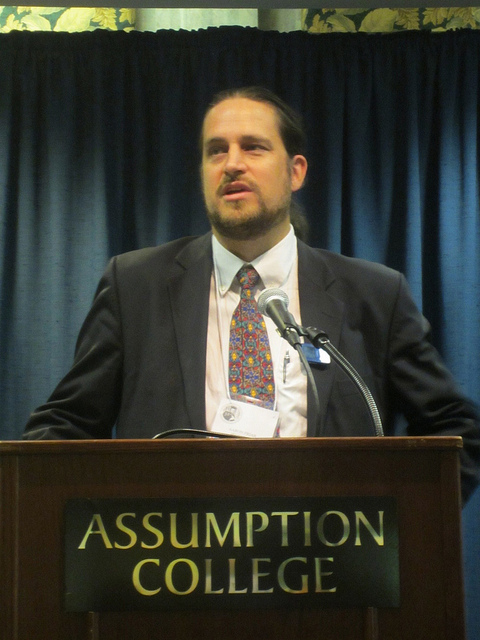 Still, this Eastern Orthodox Christian is thrilled with the prospect, and I testified as such in my talk Chesterton and Eastern Orthodoxy, which you can download as an audio file here (takes about 5 minutes to retrieve the .wav file and the talk with Q & A comes just under one hour). A written copy of the talk is available here, but I recommend listening to the audio, as there was much ground covered, especially in the Q & A, that is not in the written version. This entry was posted in Conferences, Media Reviews and tagged communion of saints, G. K. Chesterton, Orthodox Christianity by Mendicant Monk. Bookmark the permalink.